Besides the mugs, the pencil cases and the baseball caps, there are some more substantial King Naresuan goodies to be found. There’s an excellent value souvenir magazine, titled All Exclusive, which is all in Thai, but filled with colour stills, behind the scenes photos, with several pages of glossy, high quality colour in the pages inside both covers. Far rarer is the book of the making of the film. 176 pages long, with 14 full pages in English, summarising the lengthy production process of the trilogy, it’s full of fantastic photos of the action, the costumes and sets. 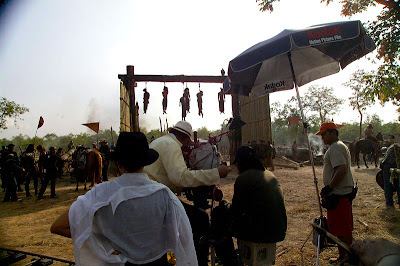 Throughout the book, the project is referred to as The Legend of Naresuan, while the cover of the book is King Naresuan, as is the film’s website. This information, probably now superceded by the marketing machine, also refers to the three films' titles as Part 1 - The End of Freedom, Part 2 - The Price of Freedom and Part 3 - The Price of Keeping Freedom. You can still get the book in softcover or hardcover online here from eThaiCD. The project has been filming for three years, with four years of research before that. The director, M.C. Chatreechalerm Yukol, has created the films for the current King and Queen of Thailand on their request, to specifically give the people of Thailand a deeper understanding of their country’s history. What a spectacular way of doing it! Incidentally, IMDB has some marvellous trivia about Yukol, the director: he went to the U.S. in the 1960s to study geology (!) and film at UCLA, sharing classes with Francis Ford Coppola (who recently supervised a version of Legend of Suriyothai for U.S. release). Yukol then went on to work as an intern for Merian C. Cooper, the producer of the original King Kong! Presumably his autobiography will be titled From King Kong to the King of Khong. The Making of the Film is available everywhere on VCD. This VideoCD is region-free and playable on most DVD players that can handle the PAL TV system. The format is still more popular than DVD in Thailand and is very cheap, retailing at under £1 ($2 USD). The disc starts with a trailer and leads into a 65 minute documentary about the making of the first two films. Again all in Thai, it’s a very visual account of the making of the film. The director is shown researching the existing historical sites from the period, by flying around to see the remaining buildings and ruins in Thailand, Myanmar, and Cambodia. His team’s biggest job is to recreate the city of Hongsawardee with a full-size reconstruction… The site, near Bangkok, has to be levelled and a moat dynamited around it. The buildings, palaces and temples, together with the iconic giant lions at the palace entrance is an awesome undertaking. The actors are cast, and trained to fight with their respective weapons. They have to learn to ride hands-free, steering their horses with their knees. The extras, partly boosted by actual soldiers, have to be drilled like an actual army. Horses are trained to fall over on command, to portray being blown over by cannon fire. It’s a stunt that the horses can do, by leaning forward and folding under a front leg, until they roll over onto soft sand. It’s a far cry from the trip wires (now outlawed) that were used to achieve the same stunt in past westerns and historical epics. We get a glimpse of the special effects – on the set, the explosives are set off to mimic cannon fire. In post-production, we see digital compositing before-and-afters. Finally, there's a little English as British composer Richard Harvey talks about the music and the huge orchestra used for the soundtrack. Harvey has spent much of his career working on music for television (Gerry Anderson’s Terrahawks (1983) being an early credit!). But obviously his work on The Legend of Suriyothai impressed the director to allow him onto this even bigger gig. ...but I did get the postcard set. Presumably, much of the footage from this documentary will make its way onto the forthcoming DVDs of the first two movies - these may be released in Thailand as early as April. Or you can get the VCD here from eThaiCD.